The perfume strip for Eau de M by Martynka interrupted the May editorial pages of Harper’s Bazaar much like the issue’s other perfume ads. A beautiful woman lies on her stomach in a bathtub with her hair wet, her backside exposed, looking over her shoulder seductively. The scent strip, coated with microencapsulated perfume, is folded over the ad’s edge like a sealed envelope, waiting to deliver its scented message. It turns out Eau de M is the scent of someone’s armpit: New York City–based artist Martynka Wawrzyniak, whose seminude image also adorns the ad. The website included no information about Eau de M, but it did provide information on the artist and even press about her exhibition Smell Me from the previous year. Self-portraits are usually photographs, paintings or visual images of some kind. In a radical departure, Smell Me featured synthesized scent reproductions of Wawrzyniak’s various bodily secretions, which served as the exhibition’s “olfactory self-portraits.” The scents were based on “essences” of Wawrzyniak’s Bikram yoga sweat, night sweat, hair and tears that she had extracted with the help of students from the Hunter College chemistry department. Sniffing these extracts—and Wawrzyniak herself—helped scent director Dawn Goldworm and perfumer Yann Vasnier reconstruct the scents using perfume ingredients. It’s the Bikram yoga sweat scent—the “ripest” one—that was microencapsulated onto the scent strip for Eau de M.
“I love this work,” Hannah Higgins wrote in an email. Higgins is a professor in the department of art history at the University of Illinois in Chicago who specializes in 20th century avant-garde art. I told her about an exchange with one of the women who’d contacted Martynka.com to inquire about purchasing Eau de M—an exchange that went from positive to negative as I provided more information about the project. Scent—visceral, primal, nonvisual, immediate—has a storied history in the art world. “The avant-garde gets into smell pretty early,” Higgins says. Italian Futurist Filippo Tommaso Marinetti staged olfactory banquets in the 1920s. In the 1960s, Takako Saito’s Smell Chess pitted savory scents against sweet scents on a chessboard, and Judy Chicago’s menstruation bathroom smelled like blood in Womanhouse, a feminist art installation and performance space organized by the artist with Miriam Schapiro, with whom she co-founded the Feminist Art Program at the California Institute of the Arts in 1972. 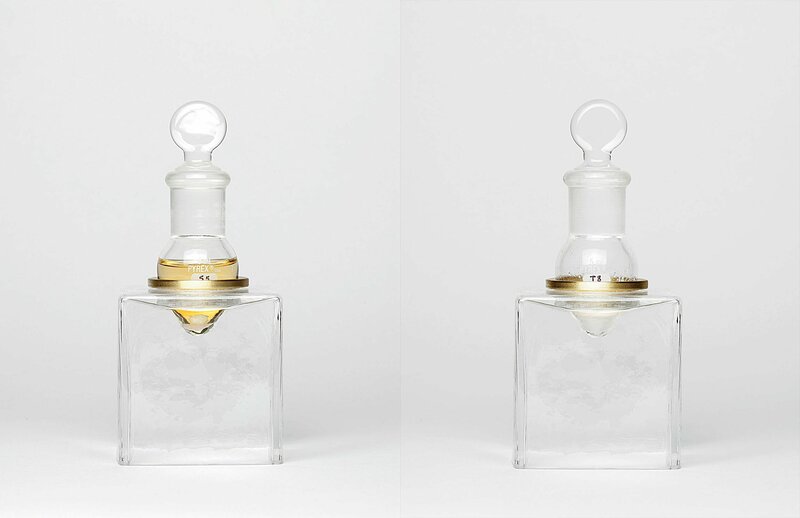 “The idea,” says Higgins, “was radical embodiment within the context of second-wave feminism.” In 2006, Berlin-based artist and scent consultant Sissel Tolaas presented The FEAR of smell—the smell of FEAR at MIT’s List Visual Art Center. In this exhibit, paint was microencapsulated with the synthesized reproductions of sweat gathered from nine men with anxiety disorder. Visitors scratched at the wall to release the various smells of fear. Eau de M is part of a tradition of art that uses olfaction. It’s also site-specific art, or art whose context helps to create its meaning. Think of Marcel Duchamp’s infamous piece Fountain, a urinal he signed “R. Mutt” that was submitted for exhibition in 1917, or the recent Prada store installation on a desolate stretch of highway near Marfa, Texas, by artists Elgreen and Dragset. After a series of friendly exchanges with NH, one of the first people to inquire several times about Eau de M via Martynka.com, and after I informed her that Eau de M was an art project I wanted to talk to her about, she began to get suspicious and then hostile. “Do you represent or are you connected to the fragrance?” she asked me in an email. I explained again that I was writing a piece on Eau de M and that it was an art piece and not a perfume she could purchase. “I’m holding Harper’s Bazaar in my hand,” she replied, “and this ad is for a new fragrance and not an art piece. Please do not contact me again as your behavior is strange."